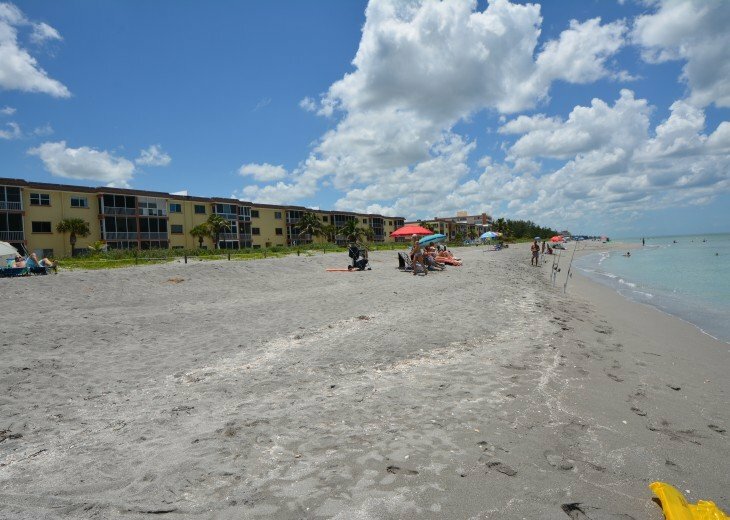 Our Condo is on beautiful Turtle Beach at the southern and most private end of Siesta Key directly on the Gulf of Mexico. When we say directly, we mean directly and not merely a Gulf “View” or a long car ride or a long walk to the Gulf. We call it “Paradise” and you could not choose a nicer location. During 2012, we completed a major renovation of our Condo to a standard suitable for us to make it our ultimate retirement home. Our living room has new tile floors, dining for 4, a leather couch and easy chair, with a wall unit containing a 40” HDTV with a blu-ray player and stereo/mp3 players. Our living room leads to a beautiful tiled lanai with a modern panoramic window on the Gulf, which also has dining for 4. Our new kitchen has new wood cabinets and granite tops, new appliances (side by side refrigerator, icemaker, water filter, smooth top convection range with a warming drawer, dishwasher, disposal, spacemaker microwave) and a new tile floor. Our kitchen is fully stocked with equipment including a new drip coffee maker with a permanent filter, toaster oven and many other small appliances. We have a beautiful Master Bedroom with a king size bed and a large window directly on the Gulf with its own 40” HDTV and a DVD player adjoined by a newly renovated tiled private bathroom with a walk-in shower. Adjoining our Master Bedroom is our walk-in closet in which is located our own stacked new LG Washer and Dryer so our guests do not have to use the shared coin laundry. Our Guest Bedroom has 2 single beds with a 33” television adjoined by its own updated private bath with a walk-in shower. New carpet was installed in our bedrooms, which completed the replacement of all of the original flooring in our Condo. We furnish our own quality linens with bath towels and beach towels for our guests., plus beach chairs and umbrellas. Housecleaning is only before arrival and after departure, but we provide our cleaning equipment for use by our guests in the interim. We also provide an iron, ironing board, hair dryer and lots of other items. Our HOA also provides boat slips on Blind Pass Lagoon and there is a boat rental facility in close proximity on Midnight Pass Road. Our guests have free use of our exclusive Comcast cable WIFI which provides cable speed Internet service privately in our Condo instead of having the use the regular public network, which sometimes is unreliable and has limited bandwidth. We have wireless telephones in our Condo connected to Comcast. The photos of the beach are for illustrative purposes only and weather, tides, and natural beach erosion cause topography changes from time to time. There is also plenty of information on our website about the fabulous restaurants nearby. We had a recent tenant who had a great time catching fish in the Gulf right in front of our Condo! We live in Venice, only 30 minutes away so we personally manage our Condo rentals and we are personally available to assist all our guests. Your rental agreement will be directly with us as owners. To confirm a booking we need to have full contact information (names, addresses, telephone numbers, email, ages of children, etc.) for all occupants. (i) If the reservation is cancelled by written notice received more than 90 days in advance of the commencement of the rental, then the deposit will be refunded less a $100 cancellation fee and the short term rental agreement will be terminated. (ii) If there is a mandatory evacuation order by a governmental authority due to a hurricane or other natural disaster, then Tenant(s) will be entitled to a prorata refund of the rent paid. We recommend that Tenant(s) purchase Trip Insurance, if coverage is desired. Our direct Gulf front condo means spending your day on the beach, swimming, fishing, strolling the shoreline, collecting shells or watching the magnificent Siesta Key Dolphins. Swimming and fishing in the Gulf; fishing in Blind Pass Lagoon, Kayaking in Blind Pass Lagoon, free boat slips with boat rental facility in walking distance. This is the shark's tooth capital of the world. Shark teeth hunting and shell hunting is a wonderful experience as is the wildlife, sea turtles, birds, dolphins, etc. Playing in the Gulf of Mexico could be all day. Mote Marine Museum on Long Boat Key is an important educational experience for all kids. Siesta Key is 7-8 miles long. Siesta Key used to terminate at Blind Pass just south Fisherman’s Cove as Blind Pass separated Casey Key from Siesta Key. However, at some time, someone filled in Blind Pass so you can actually walk (no road) across the Blind Pass area now from Siesta Key onto Casey Key. Our Condo is on the top floor (3rd floor, we are not a high rise), so no one can be above you and the views of the beach and the Gulf are terrific from our Lanai. 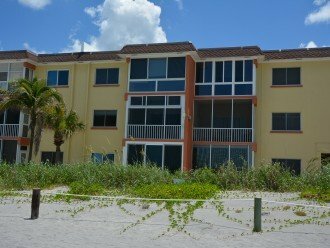 We are in close proximity to the elevator/stairs which provides the entry from the parking lot (exclusive assigned parking space) and the entry to the beach and we are a short walk to the heated pool. Our HOA and our insurance require minimum 7 day rentals. Our guest rentals commence at 4:00 PM on the beginning Saturday and conclude at 9:00 AM on the departing Saturday and we cannot rent for partial weeks. In order to maintain the highest standards for our Condo, we do not permit smoking or pets in our Condo or more than 4 occupants. This is my favorite because it is a 5- star restaurant that is locally owned and is not a chain. It has a piano and provides you some space so you do not feel crowded. 2. Ophelias On the Bay, 9105 Midnight Pass Rd (1/2 mile south of Turtle Beach Road), Sarasota, FL 34242, /. This is a famous gourmet restaurant with a fabulous Sunday brunch. 3. The Table, 5365 S Tamiami Trail (about 1.5 miles north of Stickney Point on US #41 at Phillippi Creek, look down on the right), Sarasota, FL 34231, , Fabulous happy hour, fabulous food, but tables are close to each other. 4 Turtles on the Bay, just on the other side of Midnight Pass Road. , . Karen eats there every time she visits the condo. 5. Crows Nest on the south Venice Jetty in Venice. . . 1968 Tarpon Center Dr, Venice, FL 34285. 6. Sharkys, 1600 Harbor Drive on the Gulf next to the Venice Airport. and . (500+ seats). Sharkys has 2 restaurants: Fins for “fine dining” and Sharkys as a regular Florida seafood restaurant. 7. Cassariano, 313 West Venice Avenue in downtown Venice . This is Karen’s favorite Italian restaurant. 8. Clayton’s Siesta Grille, 1256 Old Stickney Point Road (the road just before the Stickney Point bridge road), Sarasota, FL 34242, ; this is a favorite breakfast grill. 7 night minimum is required by HOA and by Insurance. Maximum of 4 Guests to maintain the really nice condition of our Condo. About the owner: Marshall and Karen live in Venice about 30 minutes away. We personally handle all our rentals. Karen is an Australian and is engaged in the business of sports marketing. Her company is . Marshall is originally from NC and is a retired Sports Lawyer. Why this property? We have never found a comparable property. 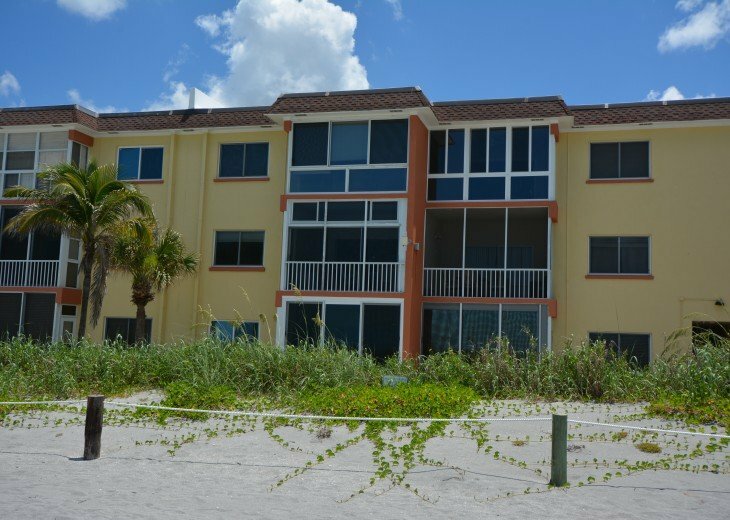 With the Gulf of Mexico directly on the West and Blind Pass Lagoon directly on the East with free boat slips and access to the Inland Waterway and the Gulf of Mexico, there is nothing like this property. This is not a high rise, only 3 stories and we are on the 3rd story so no one can be above us. There are only 84 condos all built in 1968-1969. Few have had the extensive renovation that we have undertaken and even fewer have a washer and dryer. We completely modernized our condo to the standard of our eventual retirement home. So it is almost like a brand new condo, not a condo built in 1969.